Will community screenings give BD-Live a sense of purpose? Who watches (and then chats about it on Facebook) the Watchmen? New details have leaked out about the upcoming release of Watchmen on Blu-ray which give the movie something of a social-networking slant. Purchasers of the disc will be able to link-up through BD-Live to their Facebook friends and other fans of the movie, and take part in live typed discussions while the movie is on. This kind of makes sense, as Watchmen was one of the most talked about movies of the year, but considering the movie is a strict 18 certificate, it will be interesting to see how many adults will want to chat when the movie is playing. And what sort of things will be mentioned? TechRadar reckons the discussions will mostly go: "What's that blue thing between Dr Manhattan's legs? Oh, it's his... It wasn't that big in the comics." The link-up is another push for BD-Live, the application that utilises web access on Profile 2.0 players. This is the first time that Facebook has been used in conjunction with BD-Live, but not the first live chat. The most famous being when director Chris Nolan joined a live discussion for the Blu-ray release of The Dark Knight. 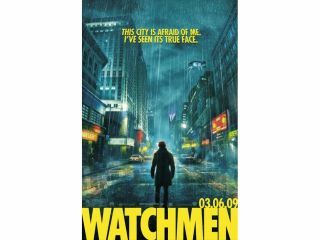 The Watchmen Blu-ray is building up to being one of the biggest releases on the format. A beefed-up version of the movie will appear on disc, complete interspersed clips of The Black Freighter, the animated comic-within-a-comic.